I had an interesting dream the other night. I returned to the firm in the financial industry that I left a while ago and visited a group of people I used to hang out with. Many of them were overjoyed to see me, though they really seemed beaten up. Many desks were empty. Some folks were asleep at their desks. One woman who greeted me had lost a hand in an accident, another women felt defensive about her looks. One man cried because he couldn’t handle the stress any more. So I figured in the dream that my light worker role was really missed, but then, in a different part of the dream, I was also shown how to improve the productivity, how to think much bigger and how to be more effective. The message of the dream was that we can have it all. My former colleagues have so much, financial abundance, a fascinating, though often stressful job, but the spiritual mindset is missing. In contrast, many folks in our spiritual community are shy to express their passions professionally, and are also often short on money. Let’s create the best of all worlds. ‘Abundance is ours’, says the Lord. Light-working was something that simply grew on me. One day a spiritual path opened up and from that day on I was on a journey beyond myself. It was in part magic and in part hard work. When done properly though, a light-worker doesn’t have to do anything. The light streams in and we just let it work through us. As the Course in Miracle states, miracles should come naturally, there should be no effort involved. It is a service to our soul siblings that we are happy to provide. Yet, we shouldn’t be full of ourselves either. The miracles that we provide work though us so we can hardly take the credit. We get healed in the process just as our friends do. The Holy Spirit does the healing and brings people together who have something to give to each other. Everyone learns and everyone benefits. When I left my old profession I took it as a graduation of sorts. As an author and spiritual coach I can reach more people with my spiritual message. Yet, as I was working on my upcoming book, ‘Breaking Free’, I suddenly had an insight that all through my life I had been on a subconscious power trip of sorts. Somehow I always had to be best at everything. First I climbed the ranks over 20 years in the education system, then at my job as an economist, and now I would have done the same at my spiritual profession. It is all the same ego drive to be someone, only this time around the drive is wrapped in spiritual clothes. After that insight, I was finally free! The Course in Miracles states, ‘The partly innocent are apt to be quite foolish sometimes’, and that was certainly me. Yes, I have been a light-worker, but I also hungered for fame and attention. The way I found out about it, I somehow always minded the folks who were grabbing the lime-light no matter where I was. So obviously I wanted to be like them. So what! It is ok if you go after what it is meaningful, a profession, a romantic love, financial riches, even a spiritual quest. Just be honest about your motivation. It is in our power to live an abundant life while being spiritual. I demonstrated it to myself! I climbed my way up from a little public high school in working class Berlin to getting a PhD in economics from a prestigious American university. I worked my way up the ranks in of the top financial firms in the world. I was just a little confused about the underlying motivation. Had you told me that I did this because I was hungry for power and fame I would have laughed at you. I would have pointed to the endless hours I spent reading about spirituality instead. Briefly during graduate school, I even wanted to become a monk! It is better to be passionate about economic, financial and romantic goals than to suppress what matters to you in the name of spirituality. This way life can help you to get what you want and you can move on to more noble goals once you truly find that abundance surrounds you. If you repress what is meaningful in the name of spirituality, life cannot show you what truly matters to you. All you will feel is an ongoing seen of deprivation and frustration and you will blame it on others since you are clearly the good guy in the picture. My advice, get what you want, just be mindful of your spiritual path. Also, please be mindful of your spiritual quest. In contrast to working towards education and professional success which can make you smarter and richer, the quest for enlightenment is a hopeless endeavor. The mind that wants to get somewhere is in fact in the way. If you are on such a quest, please take a step back. Abundance is ours to have, always. When we face scarcity in our life we have a limited mindset somewhere. Professional success, our body image, our love life, our health, our finances, you name it. Everything can be linked back to our mindset, and the movie we signed up for. Life coaches have a role to play, and I assume this role sometimes in my work. We can literally claw our way out of perceived littleness by following the carrot in front of us, one step at the time. The Law of Attraction has a role to play as well. We don’t need the incremental success, like I did over 40 years of study and work, we can get there much faster by mentally promoting ourselves. We can’t, however, catapult ourselves into Heaven. The institution that does the visualizing, the institution that wants to be somewhere else instead, has ego involvement. The ego at the end of the day will always feel little in one area or the other. Only God can surround us with abundance and She will be happy to gives us our birthright the moment we ask. When you feel scarcity anywhere please drop everything and find out where the limiting belief set it. The Story of the Prodigal Son says that we can claim our divine inheritance anytime and everywhere. It’s a journey Home though, not a journey of expansion that is driven by a subconscious limiting belief set. We light-workers sometimes perceive our function in conflict with the ego driven establishment. It doesn’t have to be that way at all. We can be the caring CEO of a company, the loving nurse who takes evening classes to become an entrepreneur one day, or the successful New Age bestseller that encourages others to embark on a spiritual journey. When you return to work tomorrow, why don’t you try a new method of thinking big. Passion and purpose can go hand in hand, and when they do, abundance will follow. 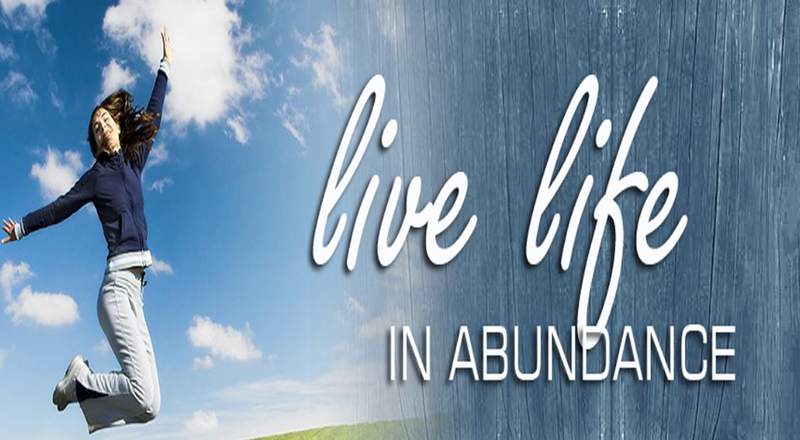 Tell me honestly, do you live in abundance right now? If not, what will you do about it?